Hi there. These are (obviously) my knuckles, done by Gareth Miller at Black Crown Tattoo, Leeds, England. Long Road is basically how I seem to go about everything of value and import in my life, whether intentionally or not – I end up taking/travelling a Long Road. This can make some things feel like quite a slog, and occasionally dispiriting, but it also serves as a reminder that, invariably, I arrive at my destination with a thorough appreciation for the journey, and a knowledge that I haven’t cut any corners to get there. My name is Ludwig Witt and I live in Sweden. 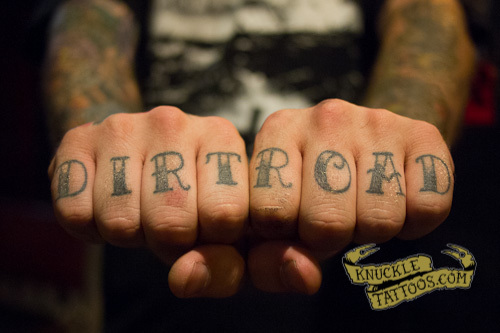 I got my knuckles done yesterday and I really like your site so here they are. The only story behind them is this. I got the words from an old John Mayall album called Hard road that features Peter Green on guitar. I thought it suited me as I’m a drummer and I’m on the road quite a bit. Since the A’s ended up on the ring fingers I wanted to do stars instead of A’s but my tattooist Räven (it means the fox in swedish) suggested spades instead and I think it turned out great. Hope you like it. Well the Long Road tattoo Means a whole lot. Through my life things have change time and time again the journey is a long road. I have move around alot first because I was in the US Air Force. while in the Air Force I got married and soon after getting out I got a divorce. then moving around trying to find home as a body Piercer. Finally ending up at Shotsie’s Tattoo Shotsie Gorman asked me to apprentice under him and make on of my long time dreams come true. Now that I have found my home and my career I am sure life will still take me through the next journey as it should.